It’s a chart that financial planners like to pull out when the stock market sells off. Recently, the story was told by MarketWatch and included the chart below. The chart shows that missing out on the 10 best days in the stock market reduces your gains by more than half when compared to a buy and hold strategy. Missing just the 30 best days results in a loss over the 20 year period that was studied. The details appear to confirm the chart, at first glance: “Over the 20 year period between 1996 and 2016, a substantial portion of the total market’s return came from only a handful of days. And as no one can know ahead of time when such days will occur, trying to trade into them, or in anticipation of them, can mean missing out on steep upward moves. Per an analysis by Calamos Investments, $10,000 invested in the S&P 500 SPX, +1.57% at the start of 1996 would’ve grown to $43,930 by the end of 2016, assuming the investor took a buy-and-hold strategy. That’s a strong annualized return of about 8.19%, although that return is below historical averages, given that period includes both the dot-com bubble bursting and the financial crisis. Miss the five best days of that period, however, and the amount you’re left with shrinks by more than a third, to $29,145, which represents annualized gains of 5.99% from the initial $10,000. The more “best days” you’re not invested for, the worse off the end result looks. The point the authors of these exercises are trying to make is that you should not try to time the market. Instead of that, you should simply buy and hold because the potential penalty associated with missing just a few of the best days is so high. These studies highlight the fact that best days occur at random times and there is no way to know which day will be the next big up day in the stock market. But, is that really true? Are big gains in the stock market completely random? That deserves some study. The next chart shows the ten best days for the Dow Jones Industrial Average. This will allow for developing some context about missing the ten best days. Two of the ten days came in the bear market that began in 2008. Six of the ten days came in the bear market that began in 1929. That accounts for eight of the ten biggest days. One of the remaining days occurred in 1933 and the other in 1987. When stocks crashed in 1987, the Dow was already below its 200 day moving average (MA). That means the Dow was trading below its 200-day MA on nine of the ten biggest days. That is an important point to consider. Specifically, missing the ten best days in the stock market would have meant missing out on bear market rallies. 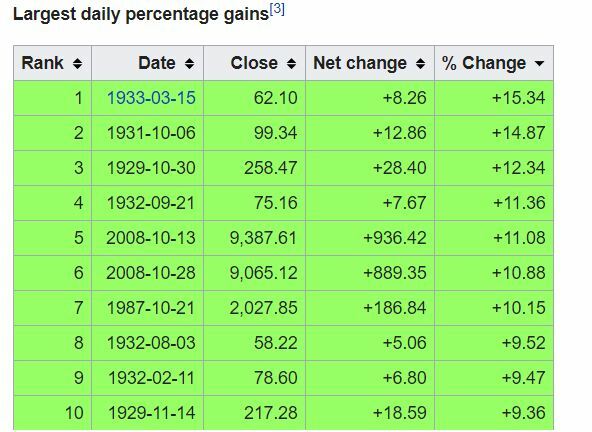 That’s a fact that is often left out and bears repeating – nine of the ten best days in the stock market were short-lived bear market rallies. What About Missing the Worst Days? 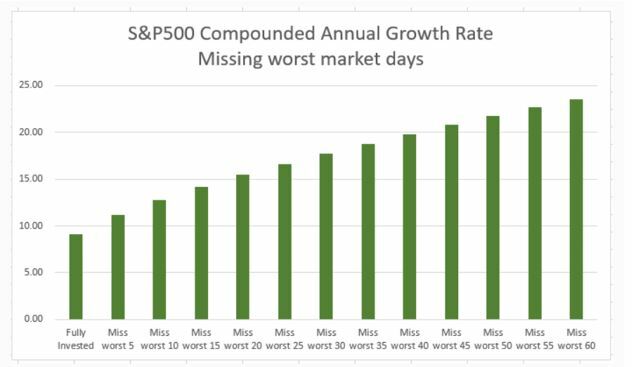 If missing the ten best days has such a large impact on returns, it seems logical to consider what would happen if an investor could miss the worst days. The results of that thought exercise are summarized in the next chart. In other words, missing the worst days has a more significant impact on performance than being invested for the best days or than being a buy and hold investor. There is certainly something appealing about missing the worst days in the stock market. Just like there is something alarming about missing the best days. But, neither feat can be achieved. However, the lesson is not that an investor should simply buy and hold. The best days come in bear markets. That’s because volatility is high when markets are falling. Missing the bear market completely would mean missing the best and the worst days and that would mean attaining performance that is lower than a buy and hold investment. However, simply sitting out the market when prices are below the 200 day MA would allow an investor to avoid large losses. And that could allow an investor to retire on time. After all, the goal of an investor is not simply to be invested. The goal is to meet some personal objective such as funding college or retiring comfortably. Understanding that goal, the investor should develop a strategy. If the strategy is to have funds available at a certain time, such as the time a child graduates high school, then the strategy should focus on avoiding risk. Avoiding risk should be the primary objective of any investor. A strategy, something as simple as using a monthly MACD indicator, could help an investor meet their goal. And, that is the objective even if it means missing the best days since that will almost guarantee missing some of the worst days. This is not what an investor hears from financial planners. But, planners are working for annual fees in many cases and won’t be paid for holding cash. They should be used when appropriate but investors need to ignore the “ten best days’ trick and ensure their money is working towards a goal.